When I started writing about chocolate places in Amsterdam I already had my two favorite spots. Until now, two things kept me from featuring them in full detail. I didn’t want to start with the greatest Amsterdam highlights. And I wanted to make sure that I spend enough time with all the other places Amsterdam has to offer (some of which I also liked a lot!). Still there’s always personal favorites. And if it comes to pralines/bonbons/chocolates1, my favorite is: Metropolitan. Metropolitan is located in Warmoestraat which really is in the center of Amsterdam. As a consequence you will find the typical Amsterdam city center mixture of people. Tourists (city travelers), tourists (weed smokers), and tourists (shopping people). Mixed with local shopping people, and people working in the area. And then people like myself that take a deep breath when entering the city center and bike as fast as possible to one of its hidden oases. 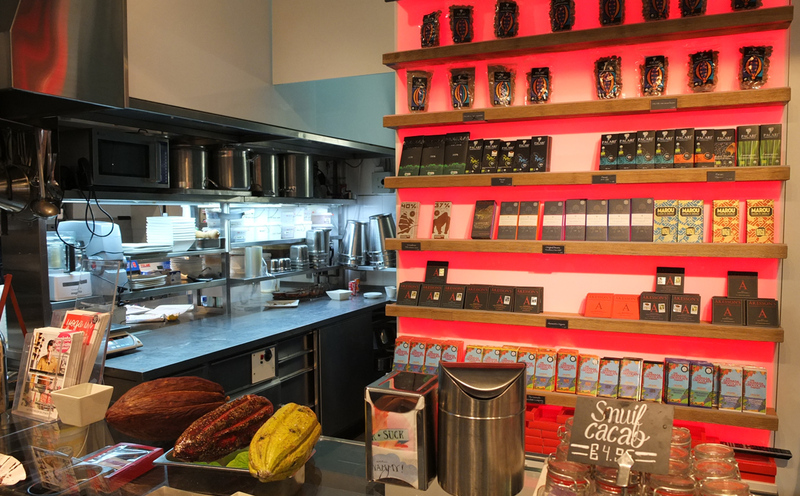 Metropolitan was started in 2009 by Kees Raat, which is something like a local chocolate hero2. To me it looks like he took another big step with Metropolitan, going far beyond being ‘only’ a chocolatier that makes fancy flavored chocolates. The central product at Metropolitan actually is the self-made ice cream, flanked by different pastries (delicious waffles!) and great chocolates. Most striking to me was that Kees Raat and his team also make all their chocolate themselves, from bean to bar. This is VERY uncommon for a chocolatier and makes Metropolitan one of two bean-to-bar chocolate makers in the Netherlands3. It is not only notable and interesting. It turns out that by making his own chocolate, the chocolate bonbons clearly gain a very original character. Most chocolatiers tend to use well-balanced quality chocolate. You could also say: neutral. The idea is that you don’t want the chocolate shell to dominate the flavor, and since chocolatiers make many different fillings but only use very few chocolate types for makes the shell, a good well-balanced chocolate seems the best match. Kees Raat’s chocolate, however, is a typical small-scale bean-to-bar chocolate in the sense that it has its very own character which I wouldn’t describe as well-balanced. Actually his dark chocolate is strong, spicy, with pronounced tartness. Tomato-Carmel: Fantastic strong caramel taste with slight and pleasantly fruity tomato notes within an intense, acidic dark chocolate. Lemon – A very fruity and tart lemon ganache within a high cocoa milk chocolate. Again very intense and good. In the end it doesn’t matter if you fully appreciate his holistic approach towards high-quality candy and chocolate. What ultimately counts is that your tongue will tell you: Delicious! !